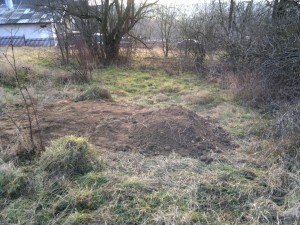 We had a report a earlier this month from sources in Rohatyn that the human remains found in 2012 underneath the Ukrainian Church on the rynek had been quietly buried by representatives of the Church and Rabbi Kolesnik of Ivano-Frankivsk, in Rohatyn’s new Jewish cemetery at the north end of town. This was consistent with our wishes, and thanks to the efforts of the Father Behune of the Church, Rabbi Kolesnik, Mr. Vorobets, Alex Denysenko, and others. The Church also donated a small wooden coffin to carry the bones to their final rest. Today Alex Den traveled through Rohatyn on his way to other work in Chernivtsi, and he stopped in Rohatyn to visit the new cemetery. Shown here are photos he took of the burial site. We are working on plans for a small marker to be placed over the grave next year; the marker will explain the circumstances of the burial, and acknowledge the cooperation between the leaders of the two faiths to bring this sad story to a close. A view south from the burial site. Photo © 2013 Alex Denysenko. 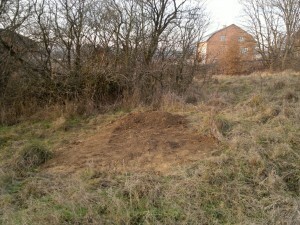 The burial site in the new Jewish cemetery. Photo © 2013 Alex Denysenko.